An About.me profile is another way to build out a positive online brand presence, while providing a platform and content to complement your resume and job search materials. About.me is platform that allows you to create a personalized web presence using a simple, visually appealing interface, and it’s incredibly user-friendly. I have my own profile setup, and have created content and profiles for a number of clients to help them boost their online personal brand presence, and increase their visibility to employers. It’s a really great, user-friendly way to give employers an extended snapshot of your skills, experience, and qualifications, while also controlling the information that’s out there for them to view. 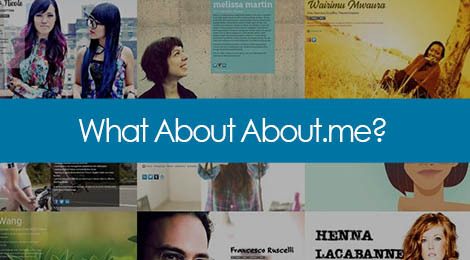 About.me allows you to organize all of your social media and online networking profile links into one place. You can include links to your LinkedIn, your Twitter account (if applicable), your Google+ or Pinterest pages, and your website. It’s a great way to give employers a snapshot of your full digital brand presence, so use it to your advantage in controlling the information they receive about you. Provide links to all relevant profiles, and create a customized page URL that includes your full time for best SEO results. There are certain things that simply don’t fit within the structure of a resume, such as why you’re making a career shift, an explanation for the gap between your last two jobs, or the intriguing personal projects you’re working on during off-hours, to boost or learn new skill sets. About.me is not LinkedIn, and it’s certainly not a resume – essentially you can write whatever you want about yourself in a several paragraph format, and it can be a great platform for housing supplemental information such as the examples mentioned. Think of it as an extended bio, or an “About Me” section of a website. What other information can you provide your audience that might supplement your resume, and position you well for the types of opportunities you’re going after? With About.me, you can select your own URL that includes your name (about.me/danaleavydetrick), which you can utilize the same way you might a custom URL in LinkedIn – in your resume, cover letter, email signature, or business card. Additionally, it’s another way for Google to index relevant search results linked to your name. In other words, you’re pushing the most relevant search results – like your social media profiles – upwards, and less relevant results toward the bottom of the pile. so that employers are getting the best, most updating information and content that you’re putting out there. You can also upgrade your account to use a custom domain. About.me is a public platform, so people don’t have to sign up or be an existing member to be able to view your information. And including your contact information through a safe, concealed platform gives potential employers and recruiters a way to get in touch without being spammy. Another bonus? There’s an app for that – for the iPhone, anyway. The bottom line is that About.me is gaining major traction as a digital marketing and branding tool for job seekers, professionals, and small businesses across all disciplines. It’s an easy, innovative, and flexible place to start and build your online presence, and even give your job applications a personal touch that stands out. Tags: About.me, career, job search, marketing, networking, personal branding, shameless self promotion, social media. Bookmark the permalink.